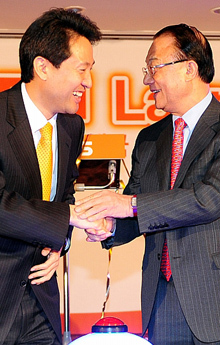 Seoul Mayor Oh Se-Hoon (left) congratulates on each other with Chairman Choi See-Joong of Korea Communications Commission at a ceremony for opening TBS eFm English-language radio in Seoul on Dec. 1, 2008. Hello, Stuart Reece here, host of Rough Around the Edges on TBS eFm. I am writing to tell you and your readers about this new show on this new station. Rough Around the Edges is a music show but it also is set to be a gateway for independent artists in Korea to get their message out to a larger audience (foreign as well as Korean artists to a foreign as well as Korean audience). "Rough Around the Edges - Radio you actually want to hear"
The show plays rock/alt/nu-metal/emocore/classic rock and punk most of the time but on the weekends I focus more on electronic music. Wednesday - I have a different guest every week from the entertainment industry (promoters, DJs, musicians, music critics, artists etc) to chat and play their requests. Saturday - I have guest DJs twice a month to chat and play a 20-30 minute set. Sunday - I have Indie Hour Spotlight - I will play 1 hour of original music from different indie bands/composers and talk about them and their upcoming shows, cd releases etc. The music will be from all genres. If you are interested, I would love to have an article about the show specifically, informing listeners that this is the place to get info on fringe artists (of all types) that have yet made it into the general public's awareness. Also, to inform artists to contact me with information on their upcoming exhibitions, DJs and bands with their demos and show dates and industry people to come on as guests. My show is about music but its also about giving a voice to a community that doesn't fit into the narrowly defined definitions of 'popular' and 'profitable.' This is about art. This is not about marketability. Thanks - please give me a shout to chat more when you have time... or, tune in and email some requests.